Superman and Martian Manhunter rumble with Lobo in Metropolis. The Main Man doesn't care much about bystanders, so Supes has to take things out of city limits - with a quick right-handed wallop to Lobo's jaw. Safe on the outskirts, the two ex-Justice Leaguers try to reason with the 'Bo, but that's about as effective a strategy as dallying on the Trans-Canada Highway through Montréal, i.e. You ain't getting' anywhere. Just then, the Trillians soar in, scorch our favorite martian (sorry, Marvin), and capture Superman. Later, aboard the Trillian starship, an incapacitated Superman pleas his innocence: he didn't destroy Trillia, he was merely helping a weaker species gain freedom from the clutches of a superior one. It's a bootless entreaty, as it is not the work of a single Trillian to judge the Man of Steel, but that of the entire planet of Trillia. Story - 3: Like last issue, this one had necessary beats. We needed to see the fight with Lobo, and we needed to see Superman taken to Trillia. Unfortunately, the former wasn't treated very fairly. I still think the beefier events of the fight should have started in issue #13 and carried over into this issue, culminating climactically into Superman's capture. 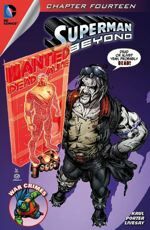 Instead, the whole fight whizzes by, and Lobo's presence, initially built up as an epic inclusion to the plot, sputters and chokes into the sunset, rather than riding boldly into it on an intergalactic hog. We may indeed see the Scourge of the Universe again this arc, so we can perhaps go easy on the heavy judgment for now. In the end, things look like they'll get interesting. I'm curious how this all turns out, and if indeed Superman did the right thing by helping the Mangals. There's a minor point I wouldn't mind having cleared up: how did the Mangals know about and contact Superman? Art - 3: Porter's close-up drawings still look quite nice, for the most part. The opening panel of Lobo is a good example. Unfortunately, most of the other stuff still just looks sloppy and/or lethargic. There's still no weight or emotion to most of the characters. Take the citizens seen in panel two of page eight: there was just a fight between three super-powered beings; buildings are smashed and cars are flipped, and here are the citizens drawn looking casual, hands in pockets, eating ice cream, listening to some Menahan Street Band on iPods. No biggie. Just another day in Metropolis. It just doesn't look right. One thing I did find amusing this issue were the signs on the buildings. There's something I find oddly awesome about street signs in comic books. I'll never get tired of knowing that the fine people of Metropolis can get a good hot bowl of Minestrone at the Cup/Saucer Luncheonette.